SISTER Carol Zinn is sure that “2000-plus years out from the first group of early Christians one thing has not changed”. “Religious life still remains as a radical response to the Gospel in a particular historical cultural context,” the Sister of St Joseph said in Brisbane recently while undertaking a series of lectures. “What does change is how religious life looks when that context shifts or evolves or moves on. “If you take a long view of the Gospel continuing to be relevant to the world, then we’re about due for some expression of religious life that hasn’t been before. Sr Zinn, the former NGO representative of the Sisters of St Joseph to the United Nations and immediate past president of the Leadership Conference of Women Religious, North America, was brought to Australia by Catholic Religious Australia. Living with Gratitude, Hope and Passion is the Sister of St Joseph’s overarching theme, in celebration of the Year of Consecrated Life announced by Pope Francis in late 2014. She will deliver her Brisbane talks at the Good Samaritan Centre at Lourdes Hill College, Hawthorne, on June 30 and again on July 1. CRA’s Queensland branch also asked her to talk on related topics at parish centres in Cairns and Townsville before she heads back to the US on July 4. 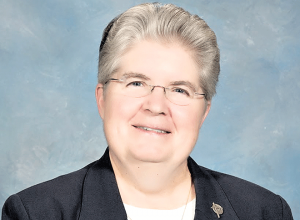 Sr Zinn has a broad perspective on religious life from leadership roles within her congregation, the LCWR and within the UN. “I represented the congregation at the UN for 13 years,” she said. “There are some 15,000 Sisters of St Joseph serving in 57 countries around the world. Clergy, religious and laity are invited to Sr Zinn’s talks. To attend any or all of the talks email office@craqld.org.au or telephone (07) 3267 9060.